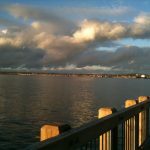 A writer/artist living in the Pacific Northwest. I'm inspired by the textures – visual and sonic -- of words on the page, and off; and all sorts of visual art. This is my second time participating in the Poetry Marathon. I anticipate writing writing writing, staring at the blank screen, staring out the window, writing writing writing, and drinking lots of coffee. And celebrating that others around the world are joining in this grand creative adventure. Thanks Caitlin, and Jacob, for making this possible! her identity speedily reviled by haute society. where there was two now only a single shoulder strap. No rain in nearly two months. to water the garden’s plants. The balcony is long as the house, my mistress’s plants plentiful. The watering can almost empty. 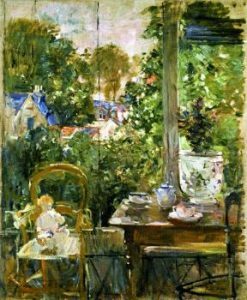 unless tethered – to a box, a table, a window frame. easily detonated, then dispersed into darkness. what we think we are supposed to be doing. Is anyone listening outside myself? Let me sit awhile, here, on your porch. friends and exes, and others I once loved. whose chair has just now been abandoned for places unknown. Let me pour out memory’s delicate brew, savor the downhill view. Let me imagine this is a memory I once recalled. — Jean-Paul Bouillon, “Marie Bracquemond: The Lady with the Parasol” (Women Impressionists, p. 242). tied outside like royal steeds. of all I surveyed below. then retying your apron strings. why did you stop drawing? overhead; no matter, we’re all in. 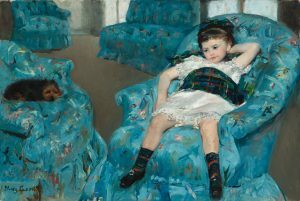 Dear Mary: I want to come back to your painting Little Girl in a Blue Armchair. To talk to you about Edgar. Rumor had it for a long while – perhaps even fifty years – you’d be amazed at how stubborn Parisian gossip is – that you were his student. You, a woman – and him, the big shot male artist introducing you to the basics of Impressionism. As if you needed instructing or help in applying color. How wrong-headed! 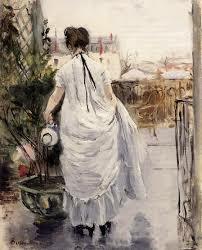 I’ve since heard that Manet once took it upon himself to rework much of one of your friend Berthe’s paintings. But who am I to judge what Edgar and you did. Can’t equals be collaborators? Early spring in the Northwest, the ground a sodden mess, but this evening the rain has ceased. Stifled by too many hours inside, under lamps, I switch off the radio which has been keeping me company, my elbows stiff from bending over papers I’m grading. Stretch and listen. Silence does not greet me. I am assaulted by frogs, the clang and bong of their night longing loud enough to hear with the windows closed. Inspired by their desire, I turn aside, open jars of tomatoes. Crush garlic, chop basil. Put a large pan on to boil. We will eat well tonight. What if the world turned red? Red, red, and red, with bits of white, orange and black. As if there were to be no mourning anymore. No lost words, no missed affection, no ungentle touching. Only relaxation, and the quiet smoothing of hair. 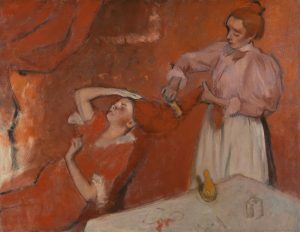 Take Degas’s “Combing the Hair,” for instance. No blue eyes, blue skies, blue bells. No broken bodies lying in green fields, no dead grasses on sandy shores. No snarled black tresses, no blonde roots showing. Only the comb’s whispers, your arm and hand caressing my hair.